On May 30th, nearly two years following its’ release in France, the Russell Crowe-Bridget Fonda comedy vehicle Rough Magic was released in the United States on twenty-eight screens. Directed by Clare Peploe with a screenplay by Peploe, Robert Mundi (or Mundy) and William Brookfield, the movie is loosely based on the novel, Miss Shumway Waves a Wand, written by James Hadley Chase. It grossed a little less than $600,00 at the U.S. box office. Set in the 1950s, Rough Magic tells the story of what happens when a pretty apprentice magician goes to Mexico to escape her fiancé, a wealthy politician, and to find a Mayan shaman who will teach her ancient principles of magic. She is being trailed by a detective hired by her fiancé. He’s a former photojournalist traumatized by what he saw in Hiroshima. The photojournalist joins her in the search for the Mayan shaman, and falls in love with her; the feeling is not reciprocated. When she finds the shaman, she drinks a potion which empowers her to do magic. The potion has life-changing effects on her and her relationship with her companion. They have strange experiences which are brought about by magic. 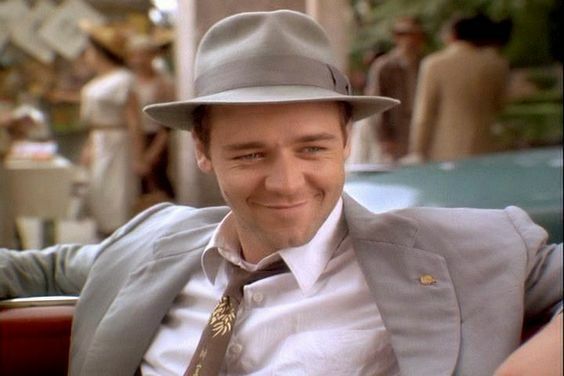 Crowe’s Alex Ross wears his fedora in the jaunty, natural manner of so many men of that era. Think Bogart and Cagney. Think Glenn Ford and Dana Andrews. And let’s also put Harrison Ford’s Indiana Jones on that list. So let us salute Rough Magic and Alex Ross because Crowe plays this role as though he’s cut from that long gone era. In fact, Alex is pretty adorable! We’ll call this page, nothing but hats!